Dear Friends, Climbers and Trekkers. This is Dan Mazur writing to you on behalf of everyone at www.SummitClimb.com and www.SummitTrek.com. This is the pre-trip newsletter for men and women of all ages from around the world joining our Spring 2009 expeditions and treks. How has your Winter been? We have had our share of heavy snow storms so far this year. However, of course it is cloudy, foggy, and raining today as I write. We also provide this on-line version in case you are already a member, or are still thinking of joining and/or wish to read about the ways we conduct our expeditions. Please be sure to tell all of your friends about what we are trying to do. Thank You Very Much. Please click one of the links below to go directly to that section of the newsletter or just scroll down. Thank you. 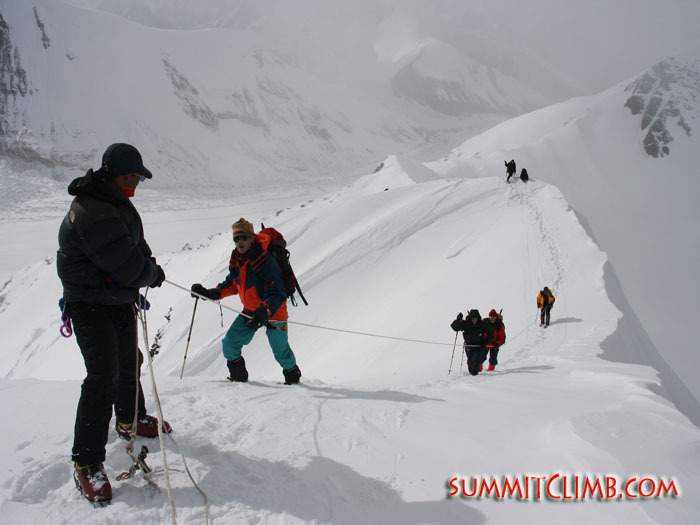 We are offering a number of exciting trips this year which you may review on our website at SummitClimb.com. Read a short description for each trip below (including how things went last year) and click links to view slideshows. Please ask as many questions as possible, so that we may understand one another's expectations. Informed team members achieve their goals with greater satisfaction, and are better and safer "team players". We love discussing our favourite subject, MOUNTAINS, so please ask us anything. NEWS FLASH: All climbs now feature western leaders, excellent food, the best sherpas, a comfortable individual tent for each person in basecamp and some of the finest equipment on the mountain. If you are considering joining (we hope you are) PLEASE BE SURE AND READ THIS EMAIL TO THE END AND UNDERSTAND IT FULLY. THANK YOU. 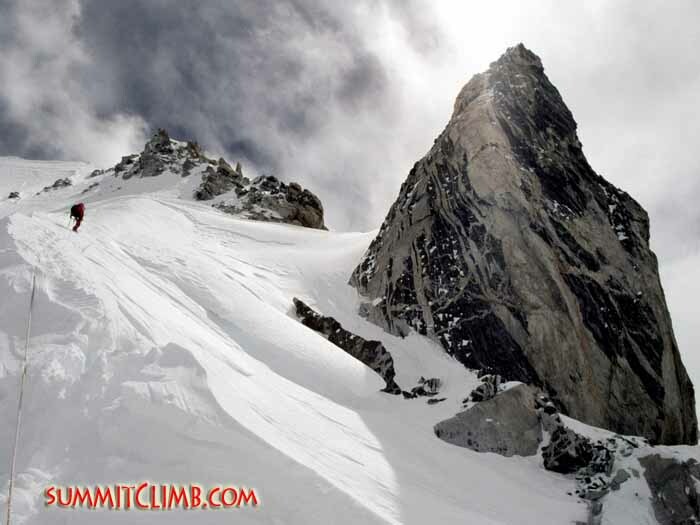 Slightly above ABC, one of our Everest climbing expedition members is heading up to ascend the North Col, where camp 1 is located at 7000 metres/23,000 feet (Tunc Findik). 2. Mount Lhotse (fourth highest in the world and climbed from the same route as Everest) In May of 2008, we placed 5 members on the top including the first Dutchman and 4 Sherpas. Leaders: Dan Mazur, Arnold Coster, Sam Mansikka. Our 5th Lhotse expedition! www.LhotseClimb.com . 29 March to 5 June 2009, Full Service: $10,750, £7550, €8250; Basic Cost: $3950, £2850, €3050 (includes internal-flights). Registration deadline: 1 February (first group), 15 February (second group). 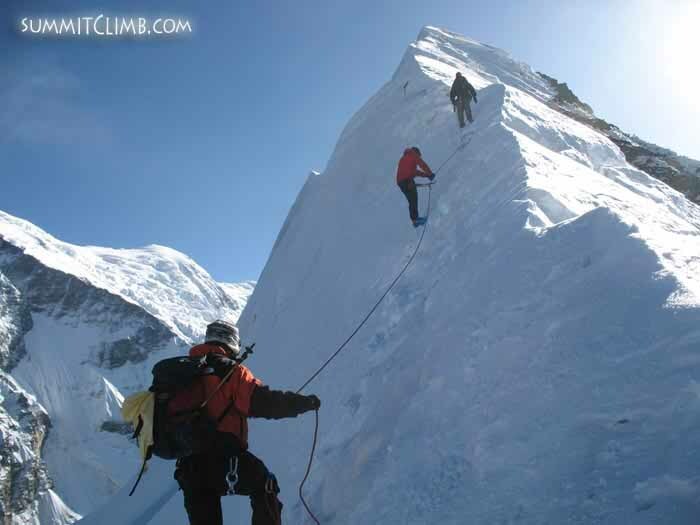 3. www.EverestTibetClimb.com . The exotic and less-expensive side of Everest, made famous by Mallory and Irvine in 1928. Leader: Arnold Coster 4 successful Everest expeditions, 2 from Tibet with 16 members and 9 sherpas on the summit . 29 March to 5 June 2009, Full Service: $22,750, £16,450, €17,550; Basic Cost: $7950, £5750, €6150. Registration deadline: 1 February (first group), 15 February (second group). Now offering (for those who need to do-it-all) the 'Everest-Traverse' over the summit from Nepal to Tibet AND Tibet to Nepal. Please ring or email us for prices and dates. Cho Oyu at sunset. Team members trekking down to basecamp after a successful season (Samuli Mansikka). 6. www.BaruntseClimb.com . A beautiful and easy 7000 metre/23,000 foot peak in remote Nepal, near Everest. 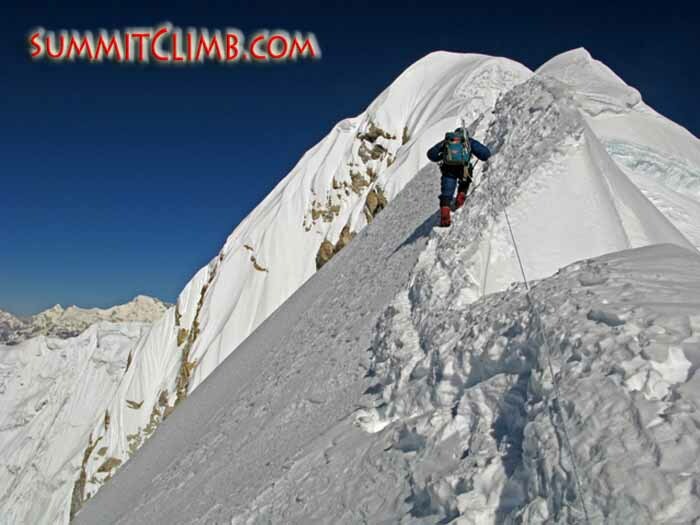 Baruntse climb also includes free-of-charge climb of famous 6000 metre/19,680 foot trekking peak Mera Peak. A fantastic way to climb 2 peaks for the price of one and see how you feel at high altitude. Easy snow-climb. 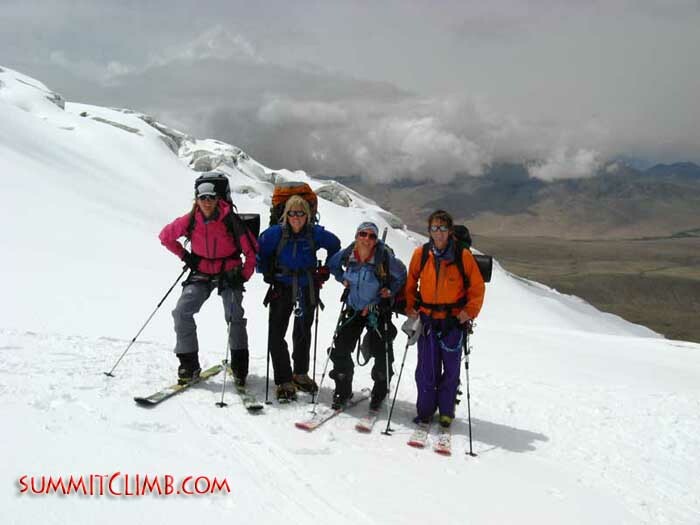 We teach you everything you need to know on Mera peak before heading to Baruntse. Get qualified for Everest. Leader: Dan Mazur, his 26th Himalayan expedition! 29 March to 5 May or 8 October to 14 November, Full Service: $6750, £4850, €5150; Basic Cost: $1950, £1450, €1550 (includes internal-flights). Registration deadline: 8 August (purchase air tickets now; flights are filling for Autumn). 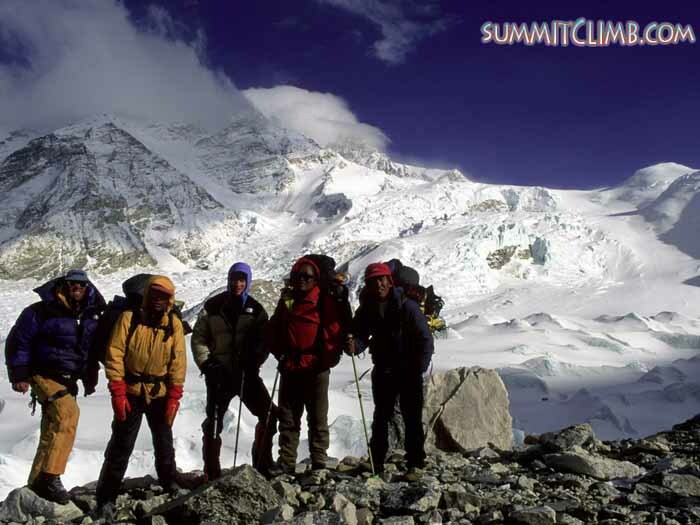 Combine with our Cho Oyu climb for the ultimate Autumn!. Below the West Col of Baruntse looking up towards the summit. Tunc Findik, former SummitClimb team member and summiter of Everest, Cho Oyu and Pumori on the summit of Baruntse. A view of the Baruntse summit ridge heading up towards the summit cone at 6950 metres/23,000 feet (Tunc Findik). 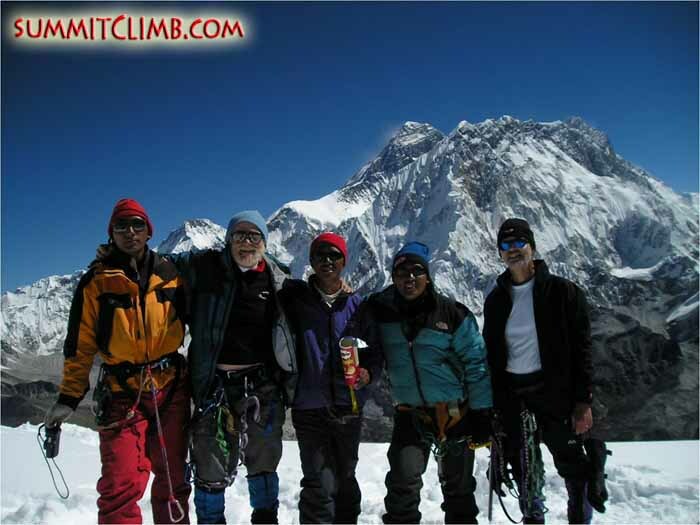 Team on the summit of Lobuche on a perfect sunny day. 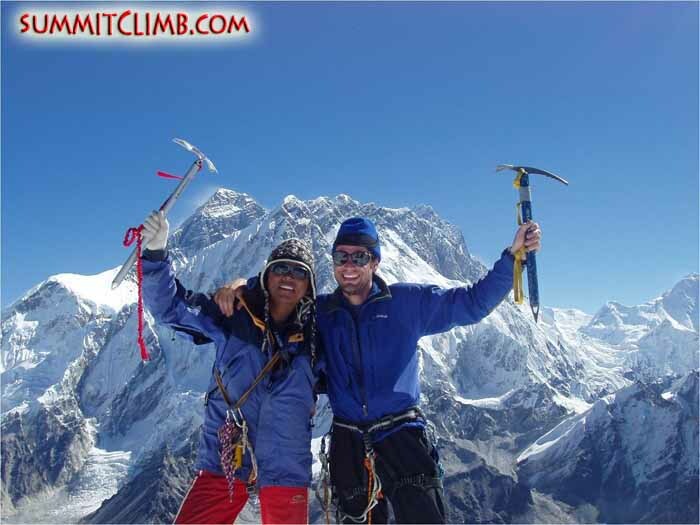 Team member and sherpa on the summit of Lobuche (Valerie Hovland). 8. www.TrekEverestNepal.com . 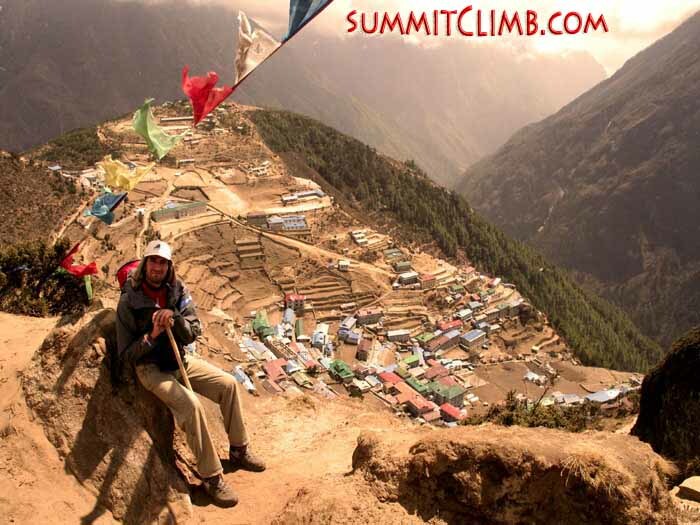 Visit world's most famous basecamp and the amazing viewpoint of Kala Patar. Easy walking on good snow-free trails. 29 March to 15 April, 1-18 May, 1-18 October, Full Service Cost: $1850, £1150, €1350 (includes internal-flights). Registration deadline: 1 February, 1 March, and 1 August (purchase air tickets now; flights are filling for Autumn). 9. www.EverestTibetTrek.com . Walk the 'Golden Highway' to Everest advanced basecamp with the best views of Everest; better than Nepal. 29 March to 17 April or 30 April to 19 May, Full Service Cost: $2750, £1750, €1950. Registration deadline: 1 February and 1 March. 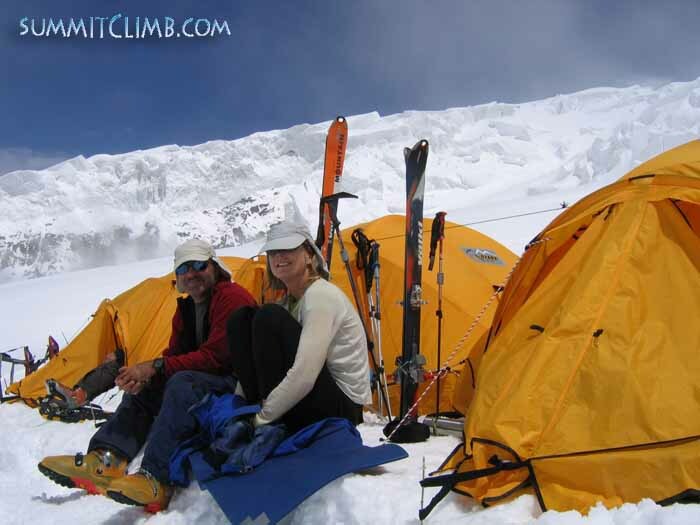 This is Kristine O'Brien and Gary Kellund resting at camp 2, 6200 metres/20,300 feet on Mustagata (K. O'Brien and G. Kellund). Our all female team, the "Lipstick Blondes" from the UK, in between camp 1 and camp 2 on Mustagata (www.lipstickblondes.com). 12. www.ShishapangmaClimb.com . Lowest of the world's fourteen 8000 metre/26,000 foot peaks. Located near Everest. Less crowded than Cho Oyu. Easy snow-climb. We teach you everything you need to know. Get qualified for Everest. Combine with our Cho-Oyu expedition and earn a 20 percent discount. Leaders: Dan Mazur and Max Kausch. Our 4th Shishapangma expedition. 1 September to 8 October, Full Service Cost: $10,250, £7350, €7850; Basic Climb Cost: $6250, £4550, €4850. 9-23 October (Cho Oyu combination includes 20% discount), Full Service Cost: $8250, £5950, €6350; Basic Climb Cost: $5050, £3650, €3850. Registration deadline: 22 February and 1 July. 1. Sam Mansikka is leading our Spring Nepal-Everest and Lhotse expeditions and knows the mountain well. He led two of our successful teams to the summit in 2008! He's the president of the Finnish Alpine Club and a very active Alpinist, in addition to being a UIAGM aspiring guide. Recently he was at the Helsinki Outdoor Show where he presented several mountain slide and video shows, and many interested people attended! 2. Arnold Coster is going to be in France for our March Mountain Meet and he's leading Everest-Tibet, Lhakpa-Ri, and North-Col this Spring. He led a very successful team to the summit of Everest in 2008 with 14 members and 14 sherpas on the summit. After repairing drill rigs in Dubai all autumn, Arnold is now working for the Dutch outdoor distributorship Carl Denig, so we expect Arnold will be well-dressed in all of the latest kit this spring! 3. Dan is going to be in France for our March Mountain Meet, is leading the Everest Glacier School in April, Spring and Autumn Cho Oyu, Autumn Baruntse and our July Glacier School. Dan led our successful Autumn 2008 Cho Oyu expedition, with 13 members and five sherpas on top. In an exciting turn of events, Dan was mentioned in the million-seller 'Three Cups of Tea' as the leader of Greg Mortenson's K2 expedition. That, combined with Dan's role in Lincoln Hall's book 'Dead Lucky' has conspired to keep Dan busy on the lecture circuit this winter, where he is raising money for www.ServiceTrekNews.org . 5. Jon Otto is leading our Mustagata climb. Jon lives in China and runs his own guide-instruction company, the Arete Alpine Institute. Jon led our succesful July 2008 Mustagata expedition with 9 members and 4 sherpas on the summit. Jon speaks fluent Chinese and he is a real asset to our leadership team after 8 successful expedtions to Mustagata! 6. Max Kausch is our star leader-in-training and we are very proud of him. He has worked his way up, climbing Ama Dablam, Lhotse, and Cho Oyu and we hope Max will accompany us to the summit of Everest this year. For more about how you could follow in Max' footsteps and learn to lead, please checkout www.LeaderInTraining.com . Recently Max released this painful-looking home-rock-gym video: http://uk.youtube.com/watch?v=0NIrW_07tr4 !! 7. Maya Sherpa leads our treks and most recently our Service Trek. She just visited Dan's home and we enjoyed watching Maya's slides of climbing Everest, and participating in the reunion of the service trek together with delicious food and our excellent trek members Barbara, Christy, Hong, Lilia, Liz, and Sandy. Steve, Robi, and Rachel were there too! During her recent 4 day visit, Maya must have received at least 7 phone calls from different aunts and uncles in the area who wanted her to visit. This lady has a big family! 1) Purchase your flight ticket now. Flights are still available. Return flights from UK-Kathmandu-UK are 600 pounds, 650 euros, $850. Return flights from USA-Kathmandu-USA are $1400. Please let us know if you need assistance in booking your ticket. We are here to help. 2) Application paperwork and payment - what we need in your file. NOW is the time for the completion of registration formalities, if you have not done so already. 4) How much money to bring. Please remember to bring lots of cash $, £, €, for your hotels and food and tips, and Nepal visa, which you will purchase upon arrival at the Kathmandu (KTM) airport, as well as a passport photo, necessary for obtaining the visa. Please also bring plenty of cash for tips + gratuities, for shopping, drinks, etcetera. You will be paying for your own hotel and meals in KTM. There are good bank, cash, atm machines, and traveler’s cheques will work, especially in KTM. Members who don’t bring enough cash are often found sitting on their hands in a dark and cold hotel room or tent while the rest of the team are out having fun enjoying the night life that is surprisingly exciting and even funny, the sometimes fun pubs and shopping. If you are going to Tibet, please be sure to bring plenty of cash $, £, €, for your sundries and tips and China-Tibet visa. Dollars work best once you are inside Tibet. Bring plenty of extra cash. You may encounter the occasionally very good inexpensive carpet and souvenir shopping that can be found, at low prices where no credit cards and no traveler's cheques may be used. Those of you going to Tibet may wish to consider bringing only dollars or changing all of your currency into local currency in Zhangmu, upon crossing into Tibet from Nepal. There is a new cash machine in Zhangmu, hopefully its still working. Be sure to bring extra cash to Tibet and Nepal basecamps for tipping the sherpas and staff as many of them will not be returning to KTM. $, £, €, work well in Kathmandu, For Nepal treks and climbs, you will change money into rupees after arriving in Kathmandu. 5) Helicopter rescue and travel insurance is required. Do you have your proof of travel and mountain rescue insurances? Remember, you need to be covered for all mishaps, including both in town, enroute, and during climbing and/or trekking. If you have sent the above, thank you very much. Please read more about insurance by "clicking here" . 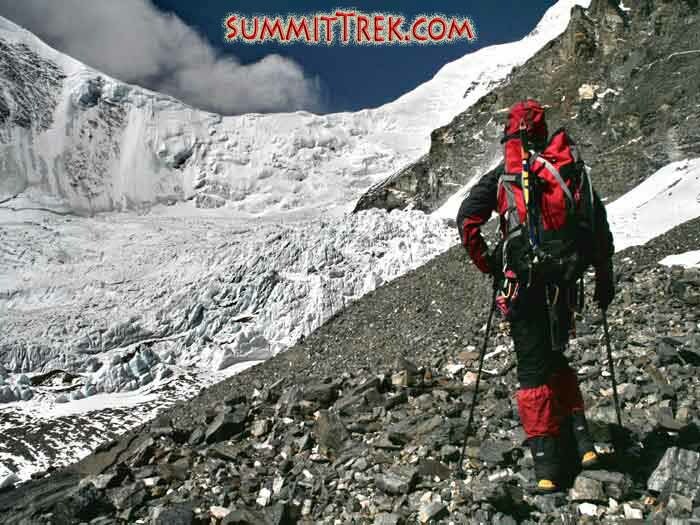 Note: For members doing Everest, Cho Oyu, Lhakpa Ri/North Col, Shishapangma, Baruntse, Service Trek, Tibet Treks our staff will meet you at the airport holding a "SummitClimb" sign. For members on the Everest Basecamp Trek Nepal, Island Peak, and Everest View Glacier School our staff will meet you at the airport holding a "SummitTrek" sign. Our staff try to personally meet your flight at the Kathmandu airport and bring you to the hotel. We were able to meet all of our team members during 2008. Do we have your exact arrival (and departure) information, including: airline, flight number, arrival date, arrival time, coming from where? If you have sent the above, thank you very much. When you leave the airport, please slowly and carefully look for the sign bearing your name (usually your last, or surname, but occasionally your first, or given name). The sign may also simply say "Summit Climb or Summit Trek". In case we miss you, please take a 300-500 rupee taxi to the hotel. Important: All members of all teams are urgently instructed to never tip more than $1 or 1 euro or 1 pound at the airport to anyone who requests a tip. These airport people are becoming really persistent and expect that visitors will not know any better. Sometimes they ask for huge amounts of money and people give it to them, so please be aware and cautious when you arrive. 9) KTM hotel - basic or luxury. This year we are offering two types of hotel, “basic” and “luxury”. Basic hotels cost approximately $25 per night (One example of a basic hotel we have used in the past is the Hotel Beijing, in KTM). Luxury hotels cost approximately $85 per night (One example of a luxury hotel is the Annapurna Hotel in KTM). The difference between luxury and basic is that luxury hotels have several restaurants, bars, and a swimming pool inside the hotel. They accept credit cards, with a surcharge. The Beijing hotel is a good quality clean, hot water when-the-sun-shines hotel in a central neighbourhood, near many tasty restaurants, and excellent mountain equipment and gift shopping. The Annapurna is a 15 minute walk from this neighbourhood. We book your hotel for you, so please only view the websites to decide which hotel you prefer and leave the arrangements to us. Hotels and food in Kathmandu only, but not out on the road, trek, or expedition, are your responsibility. 10) Arrive in KTM on the first day of our itinerary for the team orientation. All members must be present on the first day of our scheduled itinerary in Kathmandu unless you have made special arrangements. We need your passports on that day so that we can obtain the permit for you to go to the mountains, and do quite a bit of intensive orientation, training, and shopping before setting off for the mountains, in the next day or two. Below are the dates we require you to arrive in Kathmandu (of course its no problem to arrive earlier). Everest Glacier School: 29 March, or 1 May, or 6 October. Everest Base Camp Trek (and optional Island Peak): 29 March or 1 May, or 6 October. Lhakpa-Ri and North-Col: 29 March or 30 April. Cho Oyu: 23 April or 1 September. 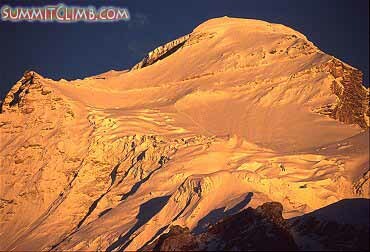 Shishapangma: 1 September (you may wish to climb it on its own or after ascending Cho Oyu). Service Trek: 5 June or 14 November. Everest Glacier School: 19 April, or 22 May, or 28 October. Everest Base Camp Trek (and optional Island Peak): 15 April or 18 May, or 24 October. Lhakpa-Ri and North-Col: 25 April or 27 May. Cho Oyu: 30 May or 8 October. 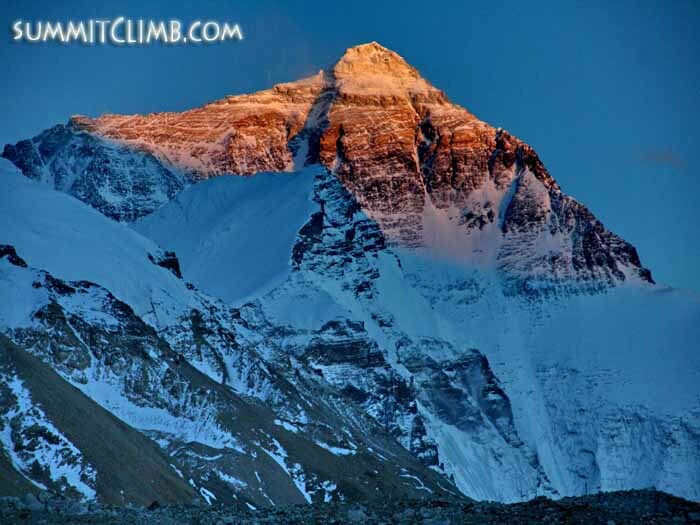 Shishapangma: 8 October or 23 October (you may wish to climb it on its own or after ascending Cho Oyu). Service Trek: 18 June or 27 November. 13) Storing excess baggage and personal possessions - valuables in KTM. We provide secure facilities in Kathmandu in which to store your extra personal items such as luggage, extra money, credit cards, passports (those people going to Tibet need their passports), jewelry, expensive watches, etcetera. These facilities are kept locked and are extremely safe. The Canadian Mallory family and others on the Hillary Step (Sange Sherpa). Members wave in the Western Cwm between camp 1 and camp 2 (Dan Mazur). 16) Buy your mattress in KTM. Regarding mattresses, above basecamp, we do not recommend anything you have to inflate. 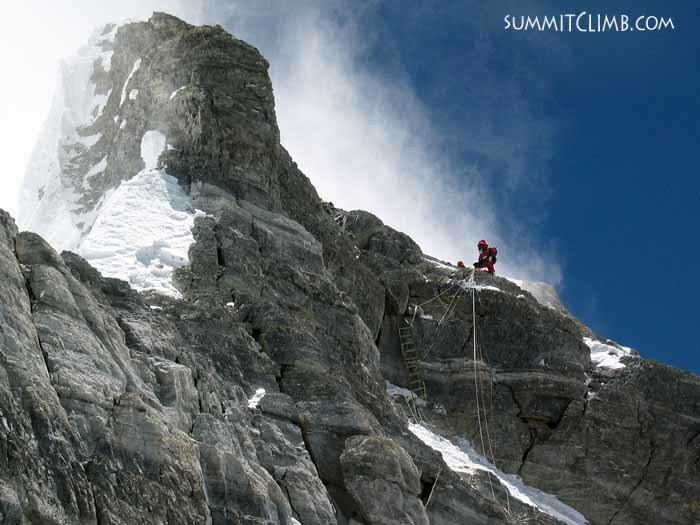 These "therma-rest" are unreliable with all of the sharp iceaxes, crampons, and rocks that we will encounter. I never saw one not puncture when used above basecamp. These are a liability and dangerous. Please don’t depend on one above basecamp. Several traditional closed cell foam non-inflatable karimat mattresses are preferred. I like to bring 3 or 4 mattresses as they are inexpensive and I want to sleep warmly and comfortably at night. These are available very inexpensively in Kathmandu, so there is no need to bring any from home. Why fly around the world with a kit bag filled with foam? Our planned schedule allows plenty of time for equipment shopping in Kathmandu. Everest: "One-Sport Everest Millet" boots high on the mountain and sturdy-leather boots for trekking to camp1. Lhotse: "One-Sport Everest Millet" boots high on the mountain and sturdy-leather boots for trekking to camp1. Cho Oyu: "One-Sport Everest Millet" boots high on the mountain and sturdy-leather boots for trekking to camp1. Shishapangma: "One-Sport Everest Millet" boots high on the mountain and sturdy-leather boots for trekking to ABC..
Baruntse: Plastic double boots for above camp 2 and sturdy-leather boots for trekking and rock-climbing to camp 2. Everest Basecamp: Comfortable lightweight walking shoes with good ankle support that are water repellant and well “broken-in”. There is no snow on our trek. Island Peak: Sturdy climbing boots that are made for crampons, in addition to comfortable lightweight walking shoes with good ankle support that are water repellant and well “broken-in”. Service Trek: Comfortable lightweight walking shoes with good ankle support that are water repellant and well “broken-in”. There is no snow on our trek. Our team at ABC on Shishapangma leaving for camp 1 (Dan Mazur). Climbing near the Gendarmes on our summit attempt at around 7600 metres/25,000 feet (Dan Mazur). Everest Summit Attempt Bonus: $400, Summit Success: $700. 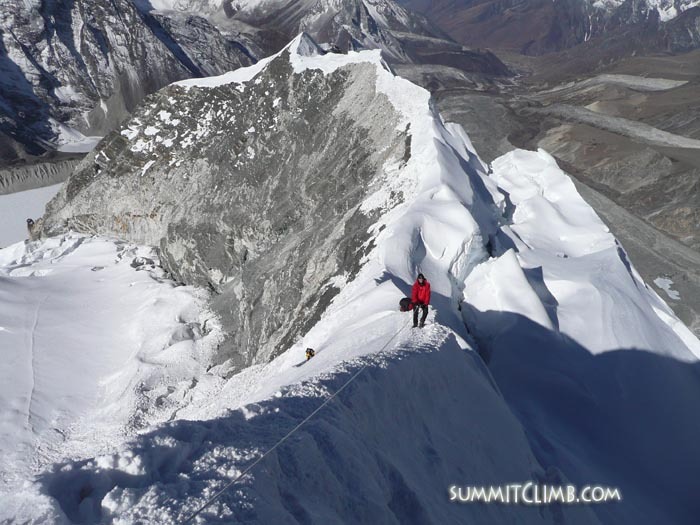 Lhotse Summit Attempt Bonus: $400, Summit Success: $700. Cho Oyu and Shishapangma Summit Attempt Bonus: $200, Summit Success: $400. 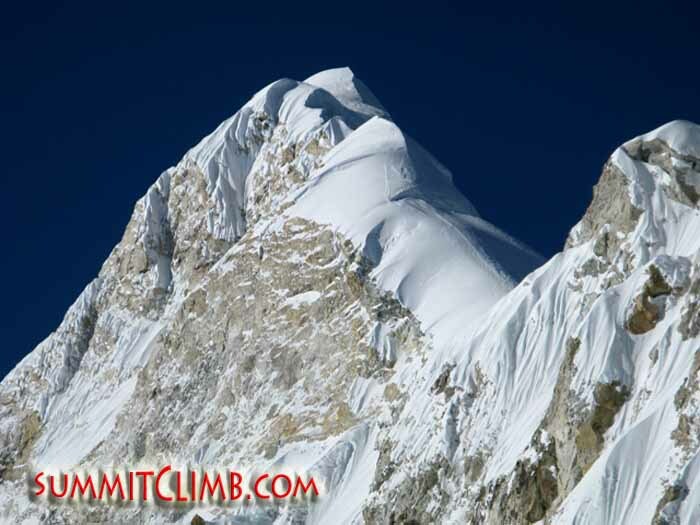 This is SummitClimb. A lot of very dedicated staff and a great team in basecamp (Dan Mazur). 22) Telephone. We plan to have access to mobile and satellite telephone on trek and in basecamp. Those wishing to use our sets are required to post a $100 deposit, prior to departure from Kathmandu. The cost is $4 per minute. Incoming calls are not possible. If your usage exceeds the deposit amount, you will be required to pay more cash in basecamp, or stop using the phone. Be sure to bring enough $, £, or €. While unable to receive telephone calls, at times members can receive short text/SMS for $4 a message from their friends and family. 23) Website where your friends, family, and colleagues, can read about your expedition. There will be a website where your family, friends, colleagues, and sponsors can watch the progress of our climb and trek. This website is a public service from SummitClimb.com. Once reaching the site please go to “recent news” and you will see the dispatches from your expedition. We have traditionally asked all members to become involved and to write or phone "dispatches" or reports about the progress of our expedition. However, these dispatches are only to be about your impressions of our climb and are strictly for public viewing. Please don’t confuse them with personal phone calls to family, loved ones, friends and colleagues at home. 24) Battery charging: laptop, ipod, mp3 player, and/or digital camera. On our climbs, we bring a solar charging system on the expedition that members have access to. As long as there is sun, we are able to charge batteries easily on the mountain. Be sure to bring your wall charger compatible to Kathmandu’s 220 volt current (when its working). If possible, please bring an automotive 12 volt charger for your laptop, digital cameras, ipod, and mp3 players, as you can plug it straight into our solar system. 25) Bring warm mittens. Special warm high-altitude mittens are necessary for all of our climbs, Baruntse and higher. Please don't frostbite your hands. As of this writing, Kathmandu does not have very good mitts and gloves, but that is certain to change. I prefer mittens to gloves, as mittens are so much warmer. f you are in London, try visiting a snow and rock shop and trying some on. Here is a link to one of the better mittens I have seen so far: http://outdoorresearch.com/home/style/home/handtools/gloves/ascent/71870 . You won't need to wear any liner gloves inside these mitts (they already have their own integral liner) so fit is very important. This company ships around the world. Be sure to discuss the size of your hand and what size mitt you might need with the person at the shop. Sometimes our members from other countries have them sent to our US office address and US team members bring them over to the mountain directly for the person. If you decide to pursue that option, please allow plenty of time. Thanks! 26) Bring or buy a figure 8. Climbers, please be sure to bring a "figure 8" for rappelling/abseiling. Modern rock climbing descenders ie: "atc’s" do not work on fixed line, and are a liability because they slow you and the team down considerably. It is hard for some people to believe until they witness this personally, but we are asking you to believe it now. Please go out and purchase a figure 8... You may also purchase a figure 8 in Kathmandu. 29) Everest, Cho Oyu, Lhotse, and Shishapangma oxygen. On Everest and Lhotse, you must have oxygen available. About half of our Cho Oyu and Shishapangma team members use oxygen. Its not like Everest where Oxygen is absolutely necessary, but many Cho-Oyu and Shishapangma climbers prefer it because it gives them a little extra edge of "insurance" that they will be feeling as well as possible when resting in the high camp and on summit day. In addition, supplemental oxygen usage has been shown to markedly reduce the incidence of frostbite. Our Sherpas will help you carry the oxygen, and 5 four-litre bottles of oxygen (or more) are recommended for Everest and Lhotse and 3 four-litre bottles should be more than enough (2 might suffice) for Cho Oyu and Shishapangma, and you also need the mask, hoses, and regulator. Or, you can have the full set of five bottles plus mask-regulator-hoses. We 100% guarantee all of our bottles and oxygen systems, and test them thoroughly with the mask/hose/regulator set-up. We have our own oxygen analysis instrumentation, and we are able to certify the contents are 100% oxygen. Additionally, we are able to measure the volume of contents in the bottle. Our bottles/masks/hoses/regulators are 100 percent guaranteed and reliable. We always have spare parts and back up bottles, masks, regulators, and hoses. We have a 40% "buy-back" policy on unused oxygen, and masks, hoses, and regulators in good condition, so its like you are renting the oxygen and equipment. A. Everest and Lhotse: 5 bottle set: $2850 (40% buy-back policy applies). Occasionally someone requests it for Cho Oyu. B. Mask + Hoses (guaranteed to be in perfect working order and match the bottles and regulator perfectly): $210 (40% buy-back policy applies). C. Regulator for high-altitude oxygen bottle (guaranteed to be in perfect working order and match the bottle and mask and hoses perfectly): We have a 40% buy-back policy on regulators in good condition. $410 (40% buy-back policy applies). D. One large Russian Oxygen 4 litre bottle for high-altitude climbing (guaranteed to be in perfect working order and match the regulator and mask and hoses perfectly): $510 (40% buy-back policy applies). Please consider donating supplies, clothing, funds, building materials, solar equipment, etcetera, as well as your own time and efforts to the Mount Everest Foundation for Sustainable Development in Nepal and Tibet. Your donation will be used wisely by the Foundation which exists to help poor farmers help themselves. These families live in Nepal and Tibet near Everest, but far from the tourist trail where life is very primitive, making Nepal the 12th poorest country in the world and the poorest country in all Asia. The foundation builds schools and hospitals and protects fragile environments. Please see what we have been doing with recent donations at www.ServiceTrekNews.org . We encourage you to become involved and we conduct service treks and volunteer projects. 30) What have we forgotten? Please express yourself now, and communicate all of your thoughts, questions, and ideas. It is very important that we build another top team this year by working together, beginning today. We always enjoy discussing our favorite subject: MOUNTAINS. Also, this kind of conversation may help us to understand one another's expectations. 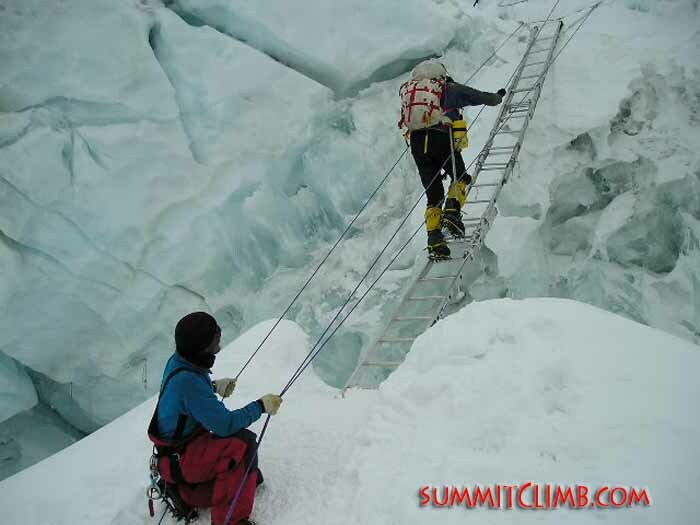 31) Let us begin climbing and trekking. We are looking forward to further discussion, to meeting, to climbing and trekking together, and to seeing you feeling well on the trek, in basecamp, the upper camps, on the summit, and on the way back down. 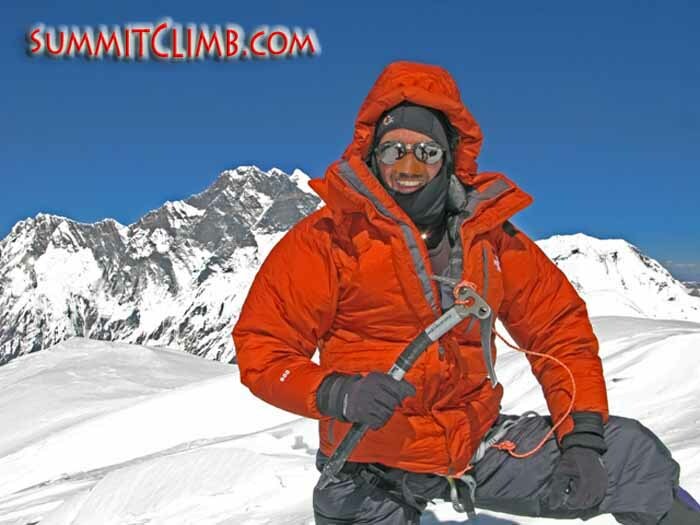 Thank you very much, Cheers for now and we look forward to climbing with you soon, Yours Sincerely, from Daniel Mazur and all of us at SummitClimb.com . Ps. THANKS FOR TELLING ALL OF YOUR FRIENDS ABOUT WHAT WE ARE TRYING TO DO.